Tiny Shimer College has survived for 135 years on great books, high hopes, and very little money. "I was always bored in school," says Barbara ("Bobbie") Groth. "I got in trouble in fifth grade for reading Ivanhoe under my desk." In 1970 she was 16. She had enough credits to graduate from her New Jersey high school but not all the required courses. Still bored, and now old enough to skip school often, she proposed an arrangement like the one some of the shop students had: work half a day, go to school half a day. Oh, no, said the administration. We can't do that, because you're college prep. So this college-prep kid quit. "My father said he hoped I wouldn't be a waitress my whole life, because he didn't think I'd like it. My boyfriend had gone to IIT--that was part of my discontent. He ran across Shimer College on a motorcycle foray across Illinois"--the college was then in Mount Carroll, 135 miles west of Chicago. "And he brought me their information." Shimer is a very small liberal arts college devoted to a rigorous Great Books core curriculum like the one Robert Maynard Hutchins imposed in the 1930s and '40s on the University of Chicago undergraduate college. Mathematics 1, for instance, starts not with a textbook but with Euclid's Elements--and everybody has to take it. "I saw that they admitted people before high-school graduation, and that it was far away from home," recalls Groth. "I didn't know anything about the Great Books." She applied in the fall, was promptly accepted and slated to start in February 1971. "My father was a little dubious about this place. What if it was a funny farm? He drove me across the country, thinking that he might have to drag me back home. The first thing when we arrived on campus, a long-haired guy jumped out of the bushes flapping his arms like a bird." Her father left her there anyway. "I used to think school was the worst thing on earth. At Shimer, the worst thing about each course was that it didn't last four years." In 1852, Mount Carroll, Illinois, was a pioneer village huddled around a gristmill. Few towns in the state had any kind of schools, not even public grade schools, but this town's boosters got the Illinois General Assembly to incorporate a Mount Carroll Seminary. Once the institution existed on paper, all the locals had to provide were land, money, buildings, and teachers. They imported the teachers through a bit of 19th-century networking: local attorney John Wilson wrote to Isaac Nash, a friend in rural New York State, to ask whether Nash's wife's younger sister, Frances Wood, would be interested. Wood, an orphan, had worked her way through New York Normal School and was teaching in the town of Milton, New York. Letters from an older brother about the 1849 California gold rush had whetted her appetite for western adventure, and that spring (1853), Frances and her classmate and friend Cindarella Gregory set out for the northwestern Illinois frontier. Frontier it was; the railroad ended at Janesville, Wisconsin, and the young women spent two full days traveling the last 90 miles by horse-drawn wagon. They spent much of the time stuck in apparently bottomless mud. On May 11, three days after their arrival in Mount Carroll, they began classes with 11 pupils in the Presbyterian church. "The morning was cold and dismal," according to one account written 30 years later, "and all day long the rain fell drearily on the roof, penetrating the weather beaten boards and leaving long lines of wet upon the floor." The school that was to become Shimer College was open for business, and no minor detail like the lack of an adequate building was going to hold it up. On a May morning 135 years after Wood and Gregory met their first students, Shimer College classes are about to start upstairs in an old Italianate house at 438 N. Sheridan Road in Waukegan. Two classrooms across the hall from each other are numbered (square root)2 and pi--both irrational numbers, I observe to a nearby student. "Yes," she says. "We named them about 4 AM. It was fun." Inside (square root)2, one of the last sessions of Math 1 is about to begin. Eleven of us sit around the octagonal table--eight enrolled students, one prospective student, one reporter, and one professor, Barbara Grossman Stone. Stone is a soft-spoken, dark haired woman not strikingly different from her students in appearance or demeanor; besides teaching, she serves as the college registrar. "My degree is in German," she tells me afterward. "I teach languages and find math is very similar." 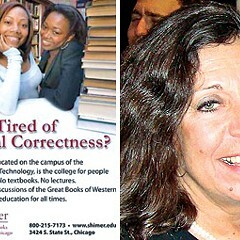 Shimer has no departmental structure that would prevent her from teaching such a class. The atmosphere this morning is at once informal and serious. We're going through a dozen pages of a book called Godel's Proof. In a landmark 1931 article, Kurt Godel demolished the quest for perfect certainty in mathematics by proving that no logical system of axioms and proofs can be both consistent and complete. This book is the climax of a course devoted to axiomatic systems and how they work; today's task, in the step-by-step understanding of the proof, is to master Godel's coding system. Every statement in formal logic, it seems, can be made to correspond to a particular number. A "Godel number" is the product of successive prime numbers (2, 3, 5, 7, 11, etc) raised to various powers. The exponents on each prime number constitute the code. For instance, "not" is "1" and "equals" is "5." So the number representing the logical-sentence fragment "not equals" is 2(1) x 3(5), or 486. "Equals not" would be 2(5) x 3(1), or 96. "That's really cool," one student says as the light dawns. "It's the ultimate in coding--you know, like when we were kids and assigned a number to each letter of the alphabet?" "Yeah," replies her friend. "I never got that either." From coding we press on to its uses; this is not easy going, although everyone seems to have done the reading. This class is more structured than most at Shimer, but Stone doesn't dominate the discussion. There are occasional silences, and when someone announces that a sentence makes no sense to her, Stone pauses, then asks, "Can anybody help Lisa out?" --and somebody does. Competition does not seem to be a factor; if anyone worries that Lisa's enlightenment will steepen the grading curve, it doesn't show. After some close reading of the text, Stone asks, "What's the point of all this?" --calling our attention back to the proof's long-term goal. "Let's look at the bottom of 64," she says, and it suddenly strikes me that everybody is. No one is staring into space, or writing love letters, or sleeping off a hangover. What kind of place is this, anyway? Shimer's recurrent financial story--great expectations to be fulfilled (if at all) only by hope, hard work, and heavy borrowing--took shape early. In 1853, the incorporators of the Mount Carroll Seminary convinced 83 people to sign up for shares totaling $2,000, a goodly sum for that time and place--but only six paid in full, and the board wound up with less than $14,000 for land and buildings. With borrowed money and help from the land sellers, in 1854 they started to build a two-and-a-half-story brick building anyway. They sent Wood back east to buy the needed furniture wholesale. Then, according to the college's centennial history, she returned to Milton and "engaged women and children to pick great quantities of fruit, which she dried and canned, as fruit was not to be had in the pioneer settlement of Mount Carroll." How do you ship hundreds of glass jars over the rutted roads of Illinois? "She also had a big supply of bedding made up and pillows from old feather-beds. These she packed around the fruit jars and shipped back to the school." That fall 75 pupils came to the new building. But by the spring of 1855 the school's finances had so discouraged the board that they offered to sell the seminary to its two faculty members at a good price, if they would promise to run it for at least ten more years. Wood and Gregory dug deep, borrowed, and bought. "It required the most exact skill in finances to meet obligations," according to a eulogy delivered after Frances's death in 1901. "In the purchase of household supplies in large quantities a very trifling difference in price was a matter of so great importance that a single transaction might turn the scale for ultimate failure or success, and, to those who did not know the facts, might seem unnecessary economy." Austerity did not make Wood and Gregory compromise what were, for the 1850s, some fairly radical principles. The seminary's first publication stated flatly, "As we claim the female mind is susceptible of the same cultivation as the male, and that there is equal demand for it, the same graduating course is prescribed for both. . . . The time devoted to each study is not specified as students will be advanced from class to class according to their progress." This egalitarianism and flexibility apparently didn't hurt enrollment, because the seminary was in the midst of another physical expansion when the financial panic of 1857 brought all construction to a halt. In order to get the unfinished additional rooms in shape for the looming fall term, "Miss Wood did the work of two men, helped handle brick, laid floors, bought glass, paint and paper at wholesale, glazed forty windows, painted the building inside and the trim, except for the cornice, outside. She also papered and repainted most of the rooms in the main building. When the opening day arrived all was ready." That December Frances Wood married Henry Shimer, a local naturalist, stonemason, and teacher. It has become one of Shimer College's most popular if least verified legends that it was to some degree a marriage of convenience; certainly it was unusual for its time. Apparently Shimer had worked on either the 1854 building or the 1857 addition or both, and the seminary owed him money it couldn't pay. In the words of Christopher Jencks and David Riesman, writing in Phi Delta Kappan for April 1966, "Perhaps in obedience to an imperative which few of today's idealistic and sincere Shimer undergraduates would understand, she married her creditor and became Mrs. Frances Shimer." Present-day Shimerites enjoy retelling this story, but no one seems to have evidence of its truth. In any event, the marriage did not terminate Frances Wood's schoolteaching career, as marriage would have for most 19th-century women schoolteachers. Henry Shimer, who became a doctor, served the seminary on occasion as resident physician and natural science instructor, but mostly he pursued his own interests and was not a partner in the enterprise. In 1866, crowding forced the school to go all-female, except for the occasional male day student--a matter of convenience rather than principle. In 1895, when the seminary's literary magazine Oread published a selection of "kind words from former students"--some of them men--the editors slyly explained "that the institution was for both sexes in its earlier days, and that young men were then fitted for college." Through the Civil War and after it, Mount Carroll Seminary prospered, but it never quite reached a plateau of financial comfort. In 1876, when bids for a new addition came in too high, Mrs. Shimer acted as her own general contractor--overseeing everything from stone quarrying to lighting installation. She brought the new building in well below the lowest bid. To keep the cash flowing, and as a logical sideline to the school's music classes, she also retailed pianos and organs by mail. Money remained a concern, although in 1889 a seminary brochure boasted, "Never in all these thirty-six years, has the Principal once asked a person for his or her patronage. Never has an agent been employed to solicit pupils or funds." After Cindarella Gregory left the school and married in 1870, Frances Shimer was the sole proprietor of the business, and she knew it needed capital--an endowment--to draw on. But nothing quite worked: In 1888, she offered to turn the school over to an ongoing board of trustees because she wanted her seminary to be "to the West what Vassar, Wellesley or Smith is to the East." The provision was that they raise $100,000 "as the beginning of an endowment fund." They couldn't. Her husband left her a $100,000 estate in 1895 "for educational purposes." His relatives contested the will and won. She owned and supervised the cultivation of orange groves near her winter home in DeLand, Florida. A killing frost wiped out that would-be endowment. Methodists and Presbyterians were reportedly interested in taking over the school from its aging principal, but Mrs. Shimer was a Baptist, and she looked to the University of Chicago, whose founding had recently been made possible by fellow Baptist John D. Rockefeller. After much consultation, she reached an agreement with U. of C. president William Rainey Harper. It would continue as primarily a women's institution, but in July 1896, Mount Carroll Seminary became the Frances Shimer Academy of the University of Chicago. It was to be administered by a 15-member board of trustees, 8 of whom were to be U. of C. faculty and two-thirds Baptists. That chance for survival was Frances Shimer's last gift to the institution she had built; she went south that fall and died in 1901, never setting foot on its campus again. "So many people my age have such blah things to say about their college," says Alan Botts. He assumes a monotone: "'Yeah, I went to Southern.' 'Yeah, I majored in psych.' 'Yeah, I had a couple of profs who were interesting.'" Botts was covaledictorian of Shimer's 1988 graduating class--but for him, as for many others here, Shimer was the school that gave him a second chance. Fresh out of high school, he spent a miserable freshman year on the vast premises of the University of Michigan, suffered in silence, and flunked out--in anonymity. "How was I notified?" he wrote later. "When I got my grades for the second semester, on the computer print-out which is sent to all students, there were the letters 'NTR' stamped across my ID number (Michigan's only way of identifying its students). 'NTR'--it means 'Not To Register.'" After a year of floundering, he called Shimer on a Friday in September, came to visit the following Monday (registration day), came back to sit in on the first day of classes Tuesday--and enrolled that same day. He was hooked on Shimer but not yet on the Great Books. "I came from an intellectual, University of Chicago, Great Books family," he says, "but somehow I never got the idea I was supposed to read them. What drew me in was the individual concern shown for me. Only after the first semester did I realize how awesome the curriculum was." "I finally felt able to study and breathe at the same time," he wrote. "I loved the faculty immediately, but not because of their great lectures, or even because they 'taught,' in the traditional sense of the word. I loved them because their goal was to make students teach themselves." The University of Chicago's patronage did not extend to anything so mundane as ready cash. For the first few years after 1896, enrollment at Frances Shimer Academy dropped, and the new board had to borrow money even to print a catalog. There was some question whether the school would outlive its founder. But U. of C. president Harper tapped Reverend W.P. McKee, a Baptist minister friend of his. 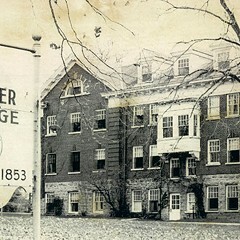 McKee took charge, raised funds for renovating the old buildings, rebuilt the campus in Georgian brick after a disastrous 1906 fire, and added a two-year junior college curriculum in 1910. Accreditation followed in 1920. A junior college was a relatively new idea then, but it may not have been an idea that greatly helped the school's money problems. As Mount Carroll lawyer and former Shimer trustee Robert Weissmiller notes, most of the women attending Shimer eventually transferred to other colleges. And many probably married men who had attended yet another school. In this process, the devotion of even the most loyal alum could well have been diluted. Shimer seems to have been something of a backwater in those years; succeeding presidents came to it from Shanghai College (in China), Linfield College (Oregon), and the visual education division of the University of Chicago Press. The big break came in 1950: Shimer was once more losing enrollment and energy, and at the same time the advocates of Hutchins's liberal arts curriculum at Chicago were looking for a likely colony. They found one in Mount Carroll. Aaron J. Brumbaugh left his post at the U. of C.--he was dean of the college and dean of students--to become Shimer's new president. He turned the women-only Frances Shimer Junior College and Preparatory School into Shimer College, a four-year college for both men and women, and began systematically retooling its faculty and curriculum. The Hutchins connection raised Shimer to a certain distinction: it became one of 12 colleges nationwide to get a sizable Ford Foundation grant to help students younger than 16 and a half enter college without completing high school first--a program Shimer kept even after the money ran out. Shimer not only imported Chicago faculty members but sent some of its own professors into the city to absorb the U. of C.'s Great Books curriculum and discussion format for classes. The Chicago bond became so tight that all admissions, placement tests, and comprehensive exams were handled on the Midway. And with characteristic U. of C. aplomb, the 1951-52 Shimer catalog stated: "The problem of education for freedom is not simple. Nevertheless, Shimer College, in modeling its curriculum on that of the College of the University of Chicago, believes it has a solution to these problems." Shimer's financial problems continued, however. The school had a total enrollment of 132 students in 1954, and according to Weissmiller, "In the summer '56 board meeting we were deciding whether we could start the fall session." But about this time, new president F.J. Mullin (also from the University of Chicago) found a fundraising angel in General Motors executive Nelson Dezendorf and in an affiliation with the Episcopal Church (which lasted for about 15 years). The new curriculum did bear intellectual fruit: of graduates from 222 colleges, Shimerites had the highest average score in the 1959 Graduate Record Exam in humanities and natural sciences. And a Syracuse University psychologist listed Shimer in Harvard Educational Review as one of 11 U.S. campuses with an "ideal intellectual climate." The others were Antioch, Bennington, Bryn Mawr, Goddard, Oberlin, Reed, Sarah Lawrence, Swarthmore, Vassar, and Wesleyan. By the middle 60s, Mullin's fundraising, in combination with the baby boom and a favorable article in Time, pushed Shimer's enrollment over the 500 mark for the first--and, so far, the last--time. "Having been rescued from sudden death and long-term attrition," wrote Jencks and Riesman cheerily, "Shimer now seems fully launched." It was early in the 1960s. "I was 23," recalls David Buchanan in his deep, slow voice. "I was married, I'd been unsuccessfully to college already, I was working for IBM and not caring for it. I decided I wanted to teach high school math and started shopping around in northern Illinois." But, he says, "Northern wouldn't accept me--my grade point average from before was awful. A couple of places indicated I wouldn't fit in because I was married; others said that I'd pretty much be starting over." Once out of step with the generational army, it seemed back then, there was no fitting back in. "My wife had thought about going to Shimer, and so we went out there on a beautiful spring day." The tree-filled campus, the picture-postcard town, the unexpected hills, the college people all charmed them. "We attended a play in which many of the actors were faculty members. We felt a lot of togetherness--and the clincher was when they told me I could get through in two years." What began as a search for a quick teaching certificate became "a remarkable experience. I'd been to Missouri School of Mines and Minerals in Rolla. It was all straight lecture, do the problems, big classes. They prided themselves on having a hard curriculum and flunking people out. There was lots of beer and rowdiness. I had fun but I was no kind of engineer. To get into small classes like this--I just loved it." He got his certificate and taught high school for 12 years in a nearby small town. "Somewhere along the way," he says, "I became an English teacher rather than math." His wife, Eileen, began teaching at Shimer in 1967, and the two pulled up stakes only when the college itself did, in the winter of 1978-79. "It was her job or mine, and I felt Shimer was pretty special." After a couple of years in Waukegan, Shimer's business manager quit. Buchanan took his place, then began teaching as well. He is now a faculty member and associate dean. "Our ideal is that any faculty member can teach any one of the core courses." He himself has taught Humanities 2 ("the closest thing we have to a literature survey course"), Integrative Studies 1 (writing and discussion skills), Social Sciences 2 (political theory--"after I had taken it"), and most recently, Natural Sciences 1--"a chemistry course I hadn't even taken before." The course reading list includes Lucretius, Aristotle, Newton, and Lavoisier. "It went pretty well. I was surprised at how much I remembered from Missouri. "Our notion is that the teacher and students are all students together. At our weekend college, I've had visitors come in and sit in on a class for an hour--and not know which one of us was the faculty member. [Shimer students and faculty always call each other by their first names.] Obviously sometimes this system of coinquiry doesn't work, when the students don't do the reading or don't do it well, and as a result the faculty member does too much talking. So we try to have students feel that that wasn't a real good class, for that reason. The text should be the center of the class, not the teacher." Sometime in the early 1960s, the Shimer students' Politics Club decided to liven things up in Mount Carroll by inviting George Lincoln Rockwell, then head of the American Nazi Party, to speak on campus. The administration inadvertently guaranteed Rockwell a full house by recommending that students stay away. Not that it mattered; Rockwell obviously had no idea what he was getting into: "Don't you feel good when your football team wins?" he bellowed at the assembled readers of the Great Books. They hooted back, "We don't have a football team." "Well, your basketball team, then." Triumphantly: "We have the national record for the longest losing streak in basketball." Recalls 1964 graduate Linnea Levy, "We were quite proud of not being a sports school. At all. We had a very good chess club, but that was different." "Shimer always seemed to be a little ahead of other colleges" during the 60s, says former trustee Robert Weissmiller. Before such protests were common, Shimer students sat in in classroom buildings to protest the administration's new no-smoking rule. During the 1962 Cuban missile crisis, they held an all-night peace vigil on a faculty member's lawn. Shimer had shed its direct, practical connection with the U. of C. in 1958, but the integrated, highly intellectual curriculum rolled right on--in fact more so in Mount Carroll than in Chicago. At most schools, it's an amazing coincidence if the ideas from one class appear in another, but in Shimer's core curriculum, ideas often overlap the subjects that usually contain them. A student from the early 60s, David Vartanoff, recalls a legendary Shimer final-exam question for Natural Sciences 3 (physics). Said the professor, "You've all had Humanities 3 [which then included Paradise Lost]. OK: If heaven's light and hell is not, explain why no work can be got out of the devil. Show your understanding of entropy. You have three hours." "Yes, I've been offered other jobs, but I've never been severely tempted," says Eileen Buchanan, veteran faculty member and vice president for development. "There's something addictive about doing this, about stretching yourself. I can't imagine being in a situation where I had to teach theater every semester and could never teach philosophy, literature, music, history, art, aesthetics, or social science. "Being confined in the usual academic structure would be much more frustrating than the kind of [administrative] work I do in the office here. I feel intellectually alive here, and not many people who have been teaching 21 years at the same place can say that. "I must have taught Antigone 80 times. But because of the discussion format, I still have classes who show me things in Antigone that I never saw before." The early 60s may have been Shimer's best years, certainly its last financially successful years--it was a comparatively ordinary highbrow college. But in 1966-67, when the school might have been capitalizing on its enrollment boom, a bitter struggle developed--"a horrible battle," recalls David Buchanan, "all year long, and it got into the classroom." "It was called the GIS--Grotesque Internecine Struggle," Eileen Buchanan adds. "And I am to this day not sure what it was about." It had something to do, maybe, with Mullin's leadership and fund-raising ability, or with drugs on the campus, or with strains between younger and older faculty. Everyone chose up sides, and what everyone remembers now is not the issues but the bitterness. Within two years, most of the faculty had left, including Mullin. Recent alumni were aghast ("Every faculty member I valued left," says Levy), current students were confused and discouraged, and faculty and administration smoldered. Shimer's enrollment began to drop like a stone, about 50 students fewer every year. "It was a long string of bad luck, bad decisions, bad hiring," reflects David Buchanan. And the things that made Shimer distinctive now seemed to work against it. It had always been small, but that on-campus intimacy also meant few alumni to tap for contributions. Even today the school has fewer than 3,000 alums total (by contrast, the University of Illinois at Urbana-Champaign graduated 5,000 just last month). Shimer had always been flexible; its 1950 make-over, though, meant that many of the pre-1950 graduates felt their bond with the school had been weakened. One 1927 graduate wrote in response to a 1976 survey: "I was sorry to see Shimer go coeducational and so far out." Shimer at the time was getting donations from less than 8 percent of its alums, compared to a national average of 1.8 percent. Shimer's location had always been off the beaten path--in 1882 and 1883 the Oread spent paragraphs explaining how easy it was to get to Mount Carroll, "though it is not shown on the railway map." Now in the late 1960s and early 1970s, train and bus service from Chicago dwindled and died. Shimer had a lovely collection of buildings--now growing old and hard to heat. And in the early 1970s, when OPEC turned off the oil spigot, fuel costs quintupled. Shimer had found the leaders it needed in past crises--Frances Wood, McKee, Brumbaugh, Mullin--but now the presidential office might as well have had a revolving door. Between 1968 and 1978, the school had four chief officers. In the fall of 1973, the trustees looked at $500,000 in unpaid bills plus $2 million owed on physical facilities, and voted to close the school's doors in December. Bobbie Groth, just back from Shimer's "year at Oxford" (still an annual tradition), had been planning to graduate that December, then arranged to stay on through the spring to take a last required course. Two weeks later came the trustees' announcement. She was stunned. "I was about 20, I didn't understand what was going on. But it was really traumatic to be almost done, and have your school taken away from you. "All hell broke loose. The students and faculty said they were not going to do it. Signs went up in the dorms: 'Hell No, We Won't Go.' I'm not sure if anybody really knew that it might not be legally possible to stay open. But people got on the phones and raised enough [about $250,000] to get a one-semester stay of execution." Groth graduated in the spring of 1974 and then "lost touch completely with the school. I was traumatized; I just didn't want to think about it." Not until years later did she even stop to visit; now she's director of admissions and public relations. "The maintenance staff, unpaid for weeks, had quit. The students were our volunteer hosts [at a summertime conference] and did the maintenance work as well. I wandered the campus and wondered how many colleges would find in their hour of desperation that their students would mow the grass, wash the dishes, clean the bathrooms. It was those whose students would not, I thought, that deserved to face bankruptcy, not Shimer." During the summer of 1977, the school's water was shut off for several weeks because of unpaid bills. According to the admissions director then, Sandra Kozlowski, they proceeded to "lug it in buckets from a house across the street." The 13 remaining faculty that fall, many doubling as administrators, agreed to work without contracts or set salaries; they would simply share among themselves two-thirds of whatever tuition income there was from the 76 students. "At the end," says Dave Shiner, faculty member and now dean of the college, who lived through those days, "we practically each had a building to ourselves." By 1978 the beautiful, peaceful campus in Mount Carroll had become an impossible burden. "We could have had all our debts wiped clean," says Shiner, "and we would have been buried again in a couple of years" just by the physical overhead. "Other schools out in the sticks have endowments and operating capital to tell the world about themselves. We had a campus in the middle of nowhere, and no money to tell anyone about it." "That's when the real decision was made," adds Eileen Buchanan: "Is it the campus and the bucolic life, or the curriculum?" There might have been another choice, she muses, recalling the fevered dreams of a small group caught in crisis: "Go monastic, raise our own food--choose the commune idea over the curriculum. If everyone had sold their private homes and moved [onto campus], and we'd turned the golf course into a field, then survival would have taken precedence." Instead, the college chose to move toward its traditional source of money, people, and ideas--metropolitan Chicago. In the fall of 1978, the campus and buildings were auctioned off. They brought $440,000, about one-tenth of their appraised value. It was a cold winter, and, Shiner remembers the question being raised--could they hold on and move in the summer of 1979? The answer: No. The school's ancient heating plant might give out at any time. "So," says Eileen Buchanan, "we packed the college into grain trucks and moved it." At the height of the blizzard that made Jane Byrne mayor, the Shimer survivors piled library books, office furniture, files, and a few movable mementos into the borrowed vehicles. "I was at the packing end," Buchanan recalls with a slight shudder, "in an unheated building, going through documents. I could stand about an hour and a half at a time. It was miserable--the coldest I think I've ever been in my life." At the other end of the road were a dilapidated Victorian home just north of Waukegan's gap-filled downtown and a welcome from Waukegan's mayor at that time, Bill Morris. The snow reached the new building's second story; somewhere there's a photograph of students walking out the upper-story windows. Shimer had taken a last, dreadful step, hoping to consolidate its present by cutting itself off from its past. Could it have a future here at the north end of the North Shore? "What I really like," says Don Moon reflectively, "is adventure." He has been a nuclear physicist, an Episcopal priest, a teacher and counselor, and (since 1979) president of Shimer College. He began teaching at Shimer in 1967, in the fallout after the GIS. He soon decided it was a place worth sticking with. Moon, who in his first profession was in charge of the design and testing of Argonne National Laboratory's juggernaut Research Reactor, teaches mostly natural sciences at Shimer. "One thing that struck me was the depth with which I was able to understand the scientific material in the Shimer curriculum, as contrasted with what I--up to then--had thought of as serious learning in the sciences." His previous learning came from Cornell and New York universities. "There, there were always questions I was afraid to ask. You ended up learning the textbook models, and you could solve everything. But the basic question--why this model?--was never asked. That kind of insight came to me only after Shimer. Then I could understand science as an art, not something given from on high." Nevertheless, since 1978 Shimer has been only a "candidate for accreditation" by the North Central Association of Colleges and Schools. "The criterion we've been falling short of, then and now, is--'Do you have enough financial backup in terms of assets, endowments, et cetera?'" Moon says that the lack of full accreditation has not affected graduate school admissions, undergraduate transfers, or financial aid to students. It does limit the number of foundations Shimer can approach for funds, and under a new Illinois law it also appears to bar Shimer graduates from substitute teaching in public schools. "That hurts. They don't look at the quality of the education, and quite likely our alumni would be excellent teachers." Moon acknowledges that bringing Shimer back to even partial financial stability is taking longer than anyone expected. The college now owns four houses in Waukegan; it is in the process of buying the old YWCA there. Future plans include a gradual expansion, which will of course entail increased income from tuition, to a maximum of 250-300 students, 25-30 faculty, and 10 staff. "That's a kind of seat-of-the-pants idea of how big the community can become without getting split into separate groups." Shimer hasn't been that large since about 1973, and Moon is anxious that the growth be gradual. "It has to do with socialization. We don't want to add faculty or staff so rapidly as to lose our shared vision. It's not that we can't learn from newcomers' ideas, but there's a sense that, when you come here, you need a kind of vulnerability, or openness to change. That's what we want in our students. And that vulnerability has to be modeled by our faculty, or it's not going to work." He is pained by the suggestion that Shimer graduates sometimes emerge a bit smug about what they have that the rest of the world doesn't. "They shouldn't be smug. It would be nice to have them go out unsmug. We've tended in the past to define our mission in terms of intellectual achievement. But Shimer has as its focus the transformation of young people when they meet someone both humorous and serious about learning. That is not just an intellectual transformation. It can't occur without personal change too, vulnerability. No one here would be happy with graduates who had 700 College Boards but were defensive and arrogant about their knowledge." But Shimer's financial problems--and its intellectual goals--have molded the college into an unusually close group. "[Students are] part of the school," says Hunt, "not just these gnomes who come into class and leave." 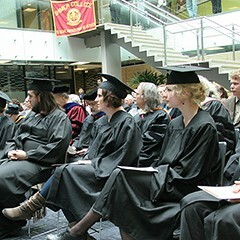 Students, coinquirers in class, are cogovernors in the Assembly of Shimer College (which sets policy under the board of trustees and is constituted as "a participatory democracy"), and cosustainers of the college's day-to-day operations. "If all the work-study students pulled out of their jobs here, there would be no survival," says Kathryn Johnson, another early entrant. "Phones wouldn't be answered, files filed, copies made. At the end of every semester, the money runs out or people find they've overworked their hours. They gripe about it, but they don't quit. "I never had any school spirit anywhere I was at all. Here, I feel like the building belongs to me. I wallpapered and painted this whole conference room with [fellow student] David [Venckus]. I didn't feel like Lincoln Park High School belonged to me. Here, I go out of my way to empty ashtrays and remove pop cans that aren't mine, and I would never do that there." That concern flows the other way, too: "The faculty has no qualms at all about seeking and finding [errant students]," says Johnson. (Hunt: "Eileen was going to have class in the dorm room of this one guy who overslept constantly.") "It's not sink or swim." But out in the world, even the rest of the academic world, it is sink or swim--a fact that can concern even the most capable graduates. Sue Curry scored very high on her Graduate Record Exams and won an extremely competitive graduate fellowship at Emory University in Atlanta. "The people there are very intelligent and very high-powered," she says. "I didn't find out if they were family, though--if they relied on each other. I know I'm going to find people like that wherever I go, but I don't know if they'll be the same people I'm working with. "A couple of people here mentioned that they might not come to commencement. Everyone was aghast. It means so much to graduate from Shimer." Hunt chimes in: "A lot of graduations, the only pressure to attend comes from parents and relatives, but not here." Johnson: "Disregarding the fact that Dave Shiner is dean, he's my friend." Skipping commencement would be a personal affront, not just the shirking of an institutional duty. "Besides," says Curry, "at how many other commencements does the dean hug every graduate?" This past academic year Shimer College enrolled a total of 78 students in all classes, and this spring graduated a "bumper crop" of 18--the largest graduating class since 1974, and one of the brightest ever--the class average on the analytical section of the GRE was in the 91st percentile. The students are almost evenly divided between the weekday and weekend colleges. Weekenders, who meet every third weekend for two days of intensive classes, tend to be older and more focused than the weekday college students, who usually live on campus. In the words of covaledictorian and weekender Jim Tudor at the May 22 commencement: "For the most part the Day students have moved directly from high school to college, play loud music, and give hard-hitting graduation speeches filled with constructive criticism for the school; while the Weekend students, like myself, have had their education interrupted, enjoy periods of silence, and give emotional graduation speeches filled with gratitude for the school." The college's on-the-books net worth remains negative, but it is far closer to zero than it was when the grain trucks unloaded at 438 N. Sheridan nearly ten years ago. The college now has an annual budget of about $750,000 and has been in the black seven of the last ten years. All full-time staffers get the same $19,000 annual salary. "For someone just getting out of graduate school," says David Buchanan, "our starting salary isn't bad. But our starting salary is our ending salary. . . . My biggest class this semester has nine people in it--but we pay for that [luxury]." Despite the pay scale, Moon says that a recent faculty search drew 40 applications for two positions. "I think people want to be part of a community enterprise focused on providing excellence. We see ourselves as experimental and goal-oriented, not just putting in time to do a job." The years in Waukegan have not all been smooth. In 1980, the U.S. Department of Education promised a grant--and then didn't fund it. Shimer had already hired eight new faculty on the strength of the promise. "We were hungry for a while," says Eileen Buchanan laconically--because veteran faculty gave up their pay to help fill the salary envelopes of the newcomers. The stress of that year prompted David Bryon, then administrative vice president, to write a complaining letter to Shimer's trustees: "The Shimer faculty possesses neither the talent nor the inclination to administer the school in a sustained and effective manner. All of us want to teach and to be taken care of. It seems the ones who are left, however, can take care of themselves. Shimer College is blue-collar Waukegan's only institution of higher learning, and for a time after its city administration changed, there was some coolness from city hall, which regarded the school as an earlier administration's project. That is no longer the case: the city is cooperating in the college's YWCA expansion, and Mayor Robert Sabonjian obligingly made the first move in a chess exhibition the school recently held at Lakehurst Mall. "There's a core of faculty here from Mount Carroll," reflects recent grad Sue Curry, referring to Moon, the Buchanans, and Shiner. "In 1979, this small group of people brought what they could from Mount Carroll. That core is still here, but they're not as omnipotent as they once were. There are more new voices now and more flexibility. "It will be interesting to see, in 10 or 20 years, when that core group has been replaced, whether the flavor of the place, this kind of self-perpetuating intentional community, will be the same." She frowns; she doesn't exactly mean "interesting." "Imagine being a member of a big family, and going away, and knowing that they'll be different people when you come back. . . . It's frightening, because I love this place." Art accompanying story in printed newspaper (not available in this archive): photos/John Sundlof. The Great Books institution makes a move to North Central College. An abysmal ranking by Washington Monthly puts the tiny Great Books school on the hot seat. A former student follows the money behind the new neoconservative bent at the local Great Books college.